Packet Power’s wireless environmental monitors provide the flexibility to monitor temperature at more points in hot cabinets and fewer in others. With the ability to add relative humidity and differential pressure measurement capabilities where required, they offer the easiest and most affordable way to gain real­ time insight into environmental conditions in your facility. Do you have critical equipment that could be damaged by a water leak? 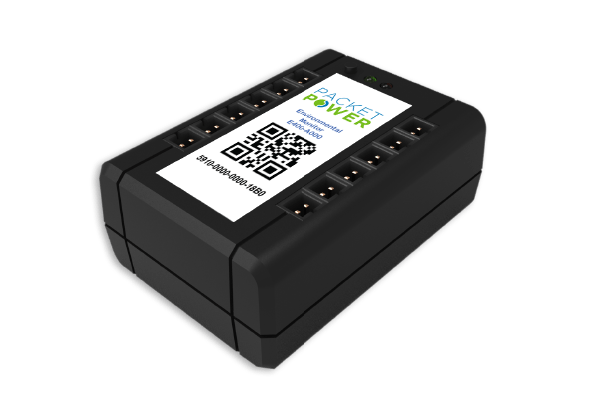 Packet Power is pleased to add a leak detector probe to our environmental monitoring offerings delivering a simple, cost-effective way to minimize the risk of damage from an undetected leak. When the leak detector senses the presence of water or other similarly conductive liquids, it communicates to Packet Power’s EMX monitoring application or any DCIM or BMS that supports SNMP or Modbus. The probe connects to the environmental monitor via a 2 meter wire that can be extended as far as 15 meters. Information is then transmitted over Packet Power’s wireless monitoring network. The leak detector can co-exist with temperature monitoring probes on the same environmental monitor. The Toshiba G9000 Series UPS 1 – 2 MEGA WATT UNITS ARE NOW IN STOCK! Two Rivers Power, started in 2004, represents manufacturers who design, produce and install high quality products focused on energy efficiencies, power reliability and overall sustainability. Covering the South Region of the United States, with offices in Memphis and Nashville, TN and Covington, LA, we work alongside electrical engineers and distributors, D&T (Digital and Technology) and facility managers, and generator/engine dealers. We also partner with electrical and government contractors, data room VARs, networking/cabling VARs, and sustainability groups to ensure their facilities are electrically reliable, redundant and energy efficient. The mission of Two Rivers Power is to be recognized as the region’s foremost trusted advisor for power reliability and business continuity. Focusing on continual personal and professional growth for our employees, customers and manufacturer’s by establishing long term, mutually beneficial partnerships using transparency, integrity, and technical know-how. Two Rivers Power simply brings the best package to the customer. Highest quality products, most experienced service partners, knowledgeable and dedicated sales team and an energetic, responsive and transparent corporate culture emphasizing integrity across the entire company.